The standard plyometric box or jumping box is an essential item for your training space. Very useful yet simple at the same time. Designed to offer you 3 jump heights with a simple twist (51 cm, 61 cm and 76 cm), making it a multifunctional item as it increases the variety and intensity of exercises. It is made from phenolic pine wood, a resistant yet light material. Its CNC (computerised numerical control) production makes the finishing and assembly very simple and precise, resulting in an extremely stable plyometric box, something essential for an article you will use to jump over. Training with this plyometric box is a perfect fit and adaptable to any fitness workout. 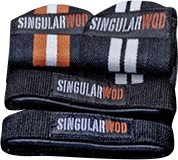 Use it to warm up, perfect your squat, include it in your WODs and even functional rehabilitation works. If our standard plyometric box is too high for you, choose our smaller plyometric box. Surface area: 0.39 m 2.